Kaavi art is slowly going to become a note in history if it is not revived and promoted. This is the message Heta Pandit, heritage activist and author of books such as Houses of Goa (co-authored with architect Annabel Mascarenhas) and Dust and Other Short Stories from Goa, geared up to send across to the audience gathered at Gallery Gitanjali, Panaji. Ms Pandit says, ‘I first saw kaavi at the Deshprabhu house in 1998. I was on a Homi Bhabha fellowship and I went to the Deshprabhu house…It fascinated me then and it fascinates me now.’ A unique art form that originated in Goa, kaavi was Goa’s gift to Maharashtra and Karnataka. This art form possesses the wisdom of ages in that it has survived the rigors of weather, time and other deleterious factors. Showing the audience a visual description of an ordinary Goan house (the Boraskar house in Poinguinim), Ms Pandit explained that while some houses will have external embellishments of decoration on windows, the dogs, lions, soldiers seen at the gate posts and finials to increase the stature of the house, most houses are devoid of images or any sort of external embellishments. When you enter the house, however, you are welcomed by beautiful art in the form of kaavi on the walls. She says, ‘Once you enter the Goan house, you see magic!’ There is always a narrative that accompanies the kaavi art. It is meant to define the sacred space in houses. Kaavi art is done on wet plaster in a manner similar to frescoes. The plaster is obtained from burning seashells in a pit, mixing this with washed sand from river beds and jaggery. This mixture is allowed to ferment for a couple of weeks and then pounded into a blended product. This is slaked with water and applied to the wall. The plaster is cured every four hours with water. Once the plaster hardens a steel bodkin is used to cut out the design. Kaavi gets its name from kaav, a red pigment found in laterite soil that is used to create the vibrant images on the snow white background of the plaster. The kaav is combined with charcoal and the milky sap of a plant. Red is the only colour used in kaavi art. The carved plaster is filled in with this kaav blend. Ms Pandit laments the slow death the art is dying in Goa when it is doing relatively better in Maharashtra and Karnataka which have temples beautifully adorned with kaavi. The ignorance of the Goan people with regard to kaavi is apparent in its approaching demise. Vetal Temple in Canacona has kaavi in its interiors. The Maruti Temple in Advalpale has a round geometric design probably drawn with a compass and infilled with small petals. The detail shows serpent heads. ‘I’ve seen a lot of serpent heads as a recurring motif. I don’t know why. Perhaps it is the Vishnu… Shesh-Vishnu connection. If you go to the Rani house in Sanquelim you find a huge kaavi with Shesh Vishnu, beautiful seven headed serpent with Vishnu reclining on its lap,’ says Ms Pandit. Many of the kaavi temples are owned by families that are struggling with poverty or have migrated to metropolitan cities and are incapable of restoring these dilapidated temples. Janardhan Mayenkar’s family owned temple in Pernem was restored in 2009 by the Goa Heritage Action Group with aid from Fundação Oriente and some private donors. The Brahmini Maya Temple, which was visited by the Goa Heritage Action Group because of its kaavi art, was demolished soon after and a new construction was raised in its place. The village had well educated people but the group’s plea to save the heritage site and preserve the kaavi art there fell on deaf ears. The villagers anticipated the group would bring governmental pressure to cease any demolition and reconstruction at the site and so went ahead with their work without any concern for the historical value of the temple. Other temples that have kaavi art are Kshetrapal Temple in Agarvaddo, and Venkatesh and Parashuram in South Goa. ‘This is not to say there are only six kaavi art temples in Goa. There must be many more. We have to research them, we have to document them, we have to film them and also revive them. We’ve given it to the world! How can we allow it to flounder here? !’ says Ms Pandit passionately. Ms Pandit surmises that the movement of this art to Maharashtra and Karnataka could possibly have come about due to the arrival of Portuguese in 1510. It was clearly developed as a coastal art because no other painting would survive the humidity, rain and salinity of coastal Konkan, but moved inland in time. Kaavi is found on the walls, in the corners, on the borders and the pillars of the Vetal Temple. In the Desai house the windows become part of the art work. Figurative patterns, borders on columns and geometric patterns are the three forms that have been observed in kaavi. The wave pattern is also commonly seen in kaavi art. Graffito, which can be seen at the Chapel of Our Lady of Monte, Old Goa, should not be confused with kaavi art. 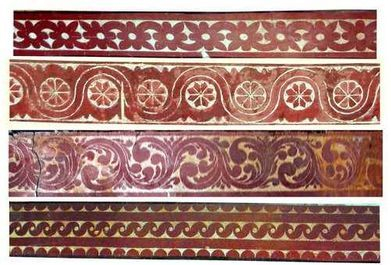 In graffito, the panel is made with the red soil and charcoal, the design that is etched out is filled with plaster and the motifs are Catholic. In kaavi, entirely Hindus motifs are applied. Graffito, unlike kaavi, has no religious significance. One problem faced in restoring this art in temples and houses is that we have no one practicing this art in Goa any more. We would have to import artisans from Karnataka and Maharashtra. Besides this there is the bigger hurdle of finance as the buildings themselves will have to be repaired before the kaavi is restored. A formidable task, but the Goa Heritage Action Group has resolved to make the people and the government sit up and take notice in order to save kaavi architectural art from disappearing completely from Goa.